I built my first bear fence earlier this fall. Interestingly, it is not in any of my bee yards that are in heavy black bear territory. But the farmer was worried about a bear seen in the area, and wanted a fence. She agreed to allow even more hives if I did the fence, and it is a great bee yard, so in went the fence. I have lived and kept bees, goats, and sheep on land that we share with black bear, cougar, coyote and a range of other species. 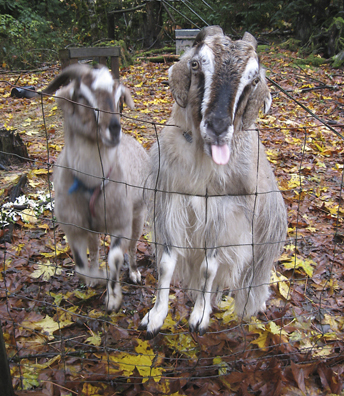 The four-legged livestock has always been fenced with woven wire – to stop them from eating all the foliage, more than keeping predators out (cougar, coyote and bear can all cross woven wire fences). 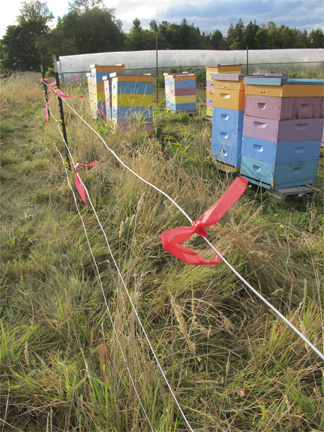 No bee fences have ever been needed : the bees are welcome to go wherever they want. Thus, this bear fence was a whole new learning experience for me. I visited a friend’s bear fence last year to see how he constructed them. Then I got on the web and started reading and downloading everything I could find. This may sound familiar to you, but it seems if you put 5 bear fence builders in a field you’re going to get 6 or 10 different ways to build a bear fence. I finally went with a basic plan from a fellow in Alaska. I figure he was keeping Grizzlies at bay, so that should work on our smaller black bear as well. I’ve filmed, grizzlies, so I have a pretty good idea of their strength, leg/paw/claw size, and what they can do when determined. Wire spacing seems all over the place with everyone. So I took the average, keeping in mind advice from one source that said top wire should be at least half the height of the predator. The fence is 32 feet X 32 feet – this would allow me to put in 30+ hives. The fence wire is a three-wire fence 14 gage steel wire. The controller is to keep the battery from over-charging. Since the battery is the most expensive component of this set up, a Charger is a good thing. Grounding Rod: The grounding rod is a 10 foot (3 meter-ish) rod – driven 9 feet into the ground (thank goodness for fence post pounders. I also bought a nice little fence tester to make sure it’s on. Of course I knew it was working when I mistakenly leaned on the positive clamp while the charger was on (ouch). Fence Tester is just a simple electrical tester that has hooks that fit over the wire. It’s nice to know it’s all working without getting zapped. The battery, battery controller, and charger all sit on a solid bottom board left over from my first year of beekeeping (finally, I had a use for it), then inside of a double stack of western boxes, a hive top, and piece of asphalt sheeting on top to keep it all dry. I used t-posts that were at our farm, which means they are of different heights. Then I popped on the plastic wire clips, and ran the wire. At the ten-foot wide “gate”, I extended the two hot wires and one negative wire across to insulated gate hooks, which each hooked to its corresponding wire loop on a corner post. When running woven wire fences, you stretch the fencing to make it tight. In electrical, you don’t do this. 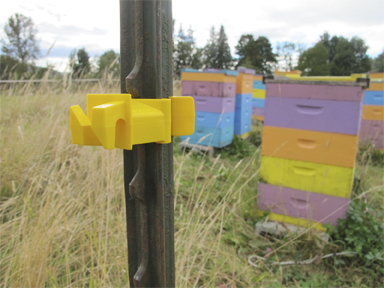 You can use little fence tighteners (metal or plastic). I had some but I didn’t need them. I did not bait the fence. There’s a lot of do it / don’t do it advice on this. I figured that if the bear was going to detour through a number of homes, cross a field, and by-pass 4 green houses, it was going to be one determined bear. It seems to me that to bate a fence is just to attract trouble. The smell of brood beyond the fence is enough of an attractant. I did put flagging tape on the fence. Red tape, because I had a roll of red flagging tape. This was more for the folks who work the farm and the kids who come to play with the farmer’s son. In the end it was a good, if expensive, learning experiment. Over all costs were about $600 US, which is what my friend with the bear fence said it would run. 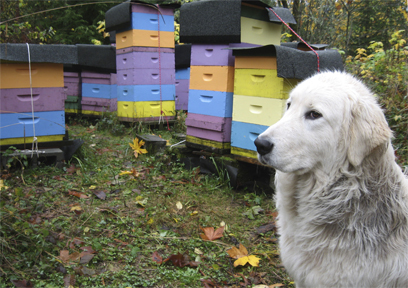 But think about it, if a bear did get one hive, that’s a 300-400 dollar loss between the gear, the bees, and all the wax and honey. So if it saves two hives it pays for itself. 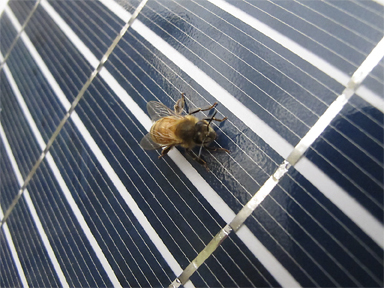 Remember to check the angle to set your solar panel – this changes by latitude. So far it’s staying charged, which is something since we’ve had nothing but rain for over two weeks – we’re in a sunny patch now. Which takes me to “what’s happening now”at Brookfield Farm Bees And Honey: I’ve been making beewax/herbal salves and lip balms, pouring the honey Ian (the husband) picked up from Stan Kolensnikov (K Brothers Pollination and Honey) last Friday, and even finding time to print pinhole photographic images – that really means it’s winter if I’m in the digital darkroom. That’s the news from Brookfield Farm Bees And Honey, in Maple Falls, Washington. What’s happening your bee world? 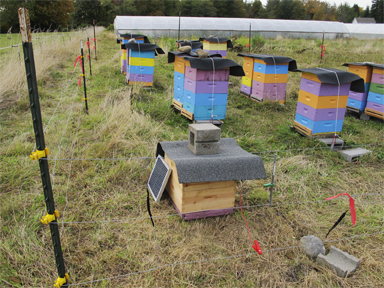 This entry was posted in Beekeeping and tagged bear, bee, beekeeper, Beekeeping, Brookfield Farm, build, Fence, hives, how to, Karen Bean, make, Maple Falls, Washington. Bookmark the permalink. thank you – I’m glad it made you smile.